As I hinted at in my write-up for the French 1980-84 shirt (number 38 in our run-down for those who missed it) It seems to me that adidas have always saved their best designs for the continent. It's certainly the case today where the flair and glamour of their European strips far overshadow creatively the more sober designs we see in the UK. However, if I can take you back 30 years to a small club on the south coast of England... there was one set of strips that threatened to buck that trend. They belonged to Brighton & Hove Albion of the Second Division, and as far as I know their incredibly striking outfits were not worn anywhere else in the UK and were seldom seen in Europe, come to that. It was a design that, lets be honest, remarkably wouldn't look out of place today amongst Nike and Puma's bold colour-block kits that are the current flavour of the month. The v-neck was identical to the one that formed part of the club's previous shirt with the merest suggestion of red adding a nice counterpoint to the blue and white. The main visual element of the shirt, though, were the three horizontal panels across the shoulders that were paired with a series of horizontal pinstripes positioned further down the jersey. At the time, any shirt adornments were always pretty regular in format so this imbalance of proportion really helped the shirt stand out. 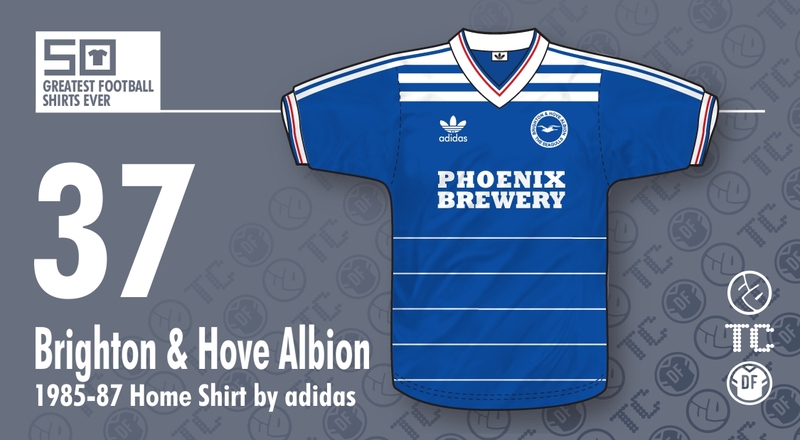 Brighton have traditionally favoured blue and white stripes but since 1980 had worn solid blue shirts, so introducing a larger proportion of white back into the design, albeit at 90 degrees, must have gone some way to appeasing the Goldstone Ground faithful. The origin of the design, and its puzzlingly few outings worldwide is unclear, the result being that its low profile has led it to being one of the most underrated kits of the '80s. The other most notable example of this design was sported by Anderlecht in the 1984 UEFA Cup Final against Spurs. Their version of the kit included an additional chest band that seamlessly led into a whole set of horizontal pinstripes running down the entire length of the shirt. Presumably it was decided that this impeded the clarity of sponsors logos and club badge (a fact that seems to have deserted the mindsets of many contemporary kit designers!) and these were removed from the Brighton shirt leaving a nice clear presentation area. 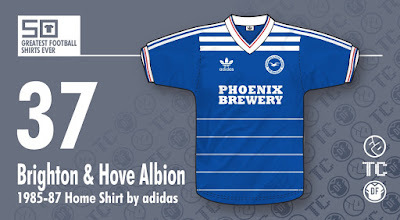 Two sponsors graced this fine, fine shirt – Phoenix Brewery in 1985-86 and the eternally humorous NOBO the following year, which just goes to show that having a double entendre as a sponsor still didn't manage to detract at all from one the classiest adidas kits to ever grace the Football League.